“We’ve got a saying on my planet. If God intended us to fly, he wouldn’t have taken away our wings.” Howard quoted. Now many people rip into Howard the Duck, I find it some what funny. Some of the actors in the movie were quite funny. What is the premise of this goofy comedy from the 1980’s? Here is the basic plot…In this film based on the comic book character, Howard the Duck is suddenly beamed from Duckworld, a planet of intelligent ducks with arms and legs, to Earth, where he lands in Cleveland. There he saves rocker Beverly (Lea Thompson) from thugs and forms a friendship with her. She introduces him to Phil (Tim Robbins), who works at a lab with scientist Dr. Jenning (Jeffrey Jones). When the doctor attempts to return Howard to his world, Jenning instead transfers an evil spirit into his own body. So the movie was directed by William Huyck and the original idea was by George Lucas for the movie. The comic was much more satire than humor. 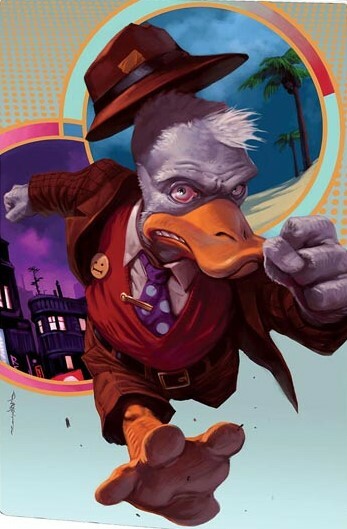 Also the current run of Howard the duck is fantastic! The soundtrack was mainly all Lea Thompson and her band, however the score parts of the film were done by Dolby’s Cube and John Barry. Thats some of what you will hear on the soundtrack. Its a bit obscure so its really hard to find a good copy. Here is the song Howard the Duck. Previous Previous post: Kaiju Alert, Let’s Protect the Rim! Next Next post: Candleshoe Update!